Car and Truck Battery Replacement in Cape Coral, Fort Myers, ACDelco, Interstate. We remove the cables from the battery and check the cables and ends for corrosion and deterioration. We also check the battery terminals or posts for corrosion. We clean the battery and cable ends. We check the electrolyte level and add water if needed. We then seal the terminals with battery post sealer. For most makes and models. Similar in quality to OES, but at a more attractive price. Batteries for cars, trucks and marine vehicles. A great battery for traveling the highways, roads and Cape Coral canal waterways. 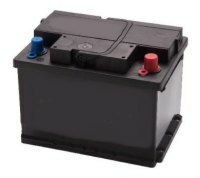 Larry's Auto normally stocks the ACDelco Advantage Battery (above). 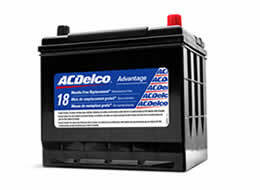 All other ACDelco batteries also available same day usually. High quality alternative to OEM products. Fits most GM vehicles and most other makes and models. The best free-replacement period under our limited warranty. Fits most GM vehicles and most other makes and models. One of the best warranties in the industry. Fits most GM vehicles and most other makes and models. Virtually maintenance-free and resists corrosion. A ©Green Eye" hydrometer on select deep cycle models. Designed to fit specific needs such as police vehicles. The perfect choice for big rigs and big pickup trucks. Designed to fit specific needs such as police vehicles. 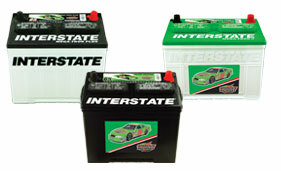 Larry's Auto can get any Interstate Battery same day in most cases.